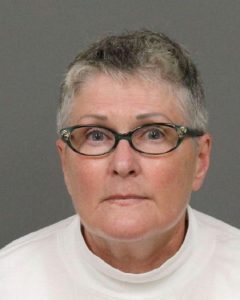 A woman who was found to have embezzled more than $1 million from a Cambria construction business reached a plea deal with San Luis Obispo County prosecutors that will place her in state prison for up to 10 years. On Wednesday, Elizabeth Edith Shaw, 68, pleaded no contest to 26 felony charges stemming from the embezzlement case. Shaw’s plea deal calls for her to receive a 13-year sentence with a clause stipulating she will spend a minimum of seven years in prison and a maximum of 10 years. Prosecutors are requesting that Shaw be ordered to spend 10 years behind bars. The Cambria woman would have faced a maximum sentence of 16 years and four months in prison if she was convicted of all the charges she initially faced. Shaw embezzled more than $1.1 million from Winsor Construction between 2005 and 2016, while working as the company’s bookkeeper, according to the SLO County District Attorney’s Office. She allegedly admitted to using the money to pay her mortgage and other bills. Another accountant hired by Winsor Construction uncovered the fraud after Shaw informed the owner of the business that there was only $28,000 left in the company’s operating account. The district attorney’s office, in conjunction with the SLO County Sheriff’s Office, conducted a 10-month investigation into the embezzlement case prior to filing charges against Shaw. Deputies arrested Shaw in April. In May, a judge granted Shaw a temporary release from jail so that she could sell personal assets to repay her victims. Shaw then returned to SLO County Jail, where she has remained since May with her bail set at $1 million. Shaw’s sentencing is scheduled for Oct. 16. Dude looks like a lady, or, vice versa. This is well and good but what about all the politicians that have stolen BILLIONS from the taxpayers? They are allowed to “retire” with full pensions and benefits, after a little harmless pension spiking or are allowed to resign only to have all records of their theft hidden so they can move on to their next government job. Arroyo Grand just got the “special” retirement from their police chief. This is called justice in America! If you know whose back to pat, then you can get away with just about anything. I am not condoning what this woman did, but as you mentioned, the list of politicians and those with ‘friends’ in high places that have done worse is very, very long. And few, if any, will ever be punished as severely. Ain’t democracy grand? obaMao being a prime example. How come he’s a multi-millionaire on a $250K/year job, eh? Same for the Klintons. Dems are crooks; it’s a job requirement.